On 18 March, 1944 only ten out of twenty-four airplanes returned. The Eighth Air Force Big Week" of 21-26 of February was just the beginning of the great air offensive in preparation for "D-Day." Each of the three air divisions were flying maximum efforts nearly every day against industrial targets of the German Third Reich. 1,000 bomber strikes were regular daily occurrences. The Royal Air Force fleet of Halifax, Lancaster, and Mosquito bombers flew night after night with their devastating loads of 10,000 pound "blockbuster" bombs and incendiaries. As one of the 392nd Bombardment Group's four squadron commanders, it was my turn to lead the group as Command Pilot, and 18 March promised to be a great day. The target: Dornier airplane assembly plant at Friedrichshafen - a city on the north shore of Lake Constance, on the German-Swiss border. It was here the great dirigibles, Hindenburg and Graf Zeppelin, were built in the late 1920s and 30s. The weather: Clear all across France and Bavaria and the target area - ideal for visual bombing with our Sperry bombsights. Opposition: We could expect the usual heavy anti-aircraft defense of the target area and German tighter attacks both in-bound and out-bound of enemy territory. Fighter cover: There would be a great concentration of friendly fighters (P-47s. P-38s. and P-51s) all along our route to defend us. Briefing was held at 0730 hours and take-off was at 0930. Assembly of our two twelve-ship squadrons and the 2nd Air Division's fourteen groups was effected on schedule. The great bomber stream of some three hundred and fifty B-24s in twelve-ship formations with "con-trails" streaming, roared across the English Channel at 20,000 feet altitude. Paralleling our course on our left was the long bomber-stream of B-l7 formations. As we crossed the French-German border just south of Strasbourg, I can still see that tremendous azure-blue skyscape filled with formations of B-24s and B-17s rushing eastward with P-38s, or P-47s or P-51s Is ever circling above - searching for attacking German airplanes. It was a sight that no camera or painting can possibly capture in perspective or magnitude. It must have been an awesome sight - and sound - to the eye-witnesses below. Separate from the regular formations of B-l7s. I remember seeing a six-ship formation. They were out there all alone - and what I considered - "asking for IT." It wasn't until later that I learned that that was exactly what they were doing - asking for the German Luftwaffe to attack them. They were specially armored and equipped airplanes that were deployed so as to draw the enemy fighters away from their more vulnerable brothers." They didn't even carry bombs. I also remember seeing German fighters attacking a "tail end Charlie." Any airplane that was stricken with engine trouble or for some other reason lagged behind was especially vulnerable to attack, and what I saw was typical. In spite of our fighter cover the Jerries would sneak in and shoot up a lone airplane in no time at all. They could also be vectored to a lone or isolated formation and there attack it in force. The 392nd was next to last in the 2nd Air Division bomber stream of fourteen group formations, and I didn't see any fighters attacking the B-24s ahead of us. Our group did have the misfortune of losing two airplanes in a mid-air collision just after crossing the Channel into France. The snowy Alps were shining bright to our right as we skirted the Swiss border. My formation of two squadrons were holding a nice formation. I was really proud of them. The bomb run was so designed that we would fly eastward past our Friedrichshafen target, then circle to the right toward the initial point (IP) of our bomb run on the east end of Lake Constance - about twenty miles from "bombs away." After bomb-release, we would make a right turn to assemble the group, then head out-bound for home. As we turned over the IP our bomb-bay doors were opened and all bombing equipment was in readiness and functioning properly. The target area was clear of clouds, and I was in high hopes of a really successful bombing attack. The lead crew was one of the 392nd's best. This was their twenty-fifth and last mission. I remember how blue Lake Constance looked as we flew along its shore at 20,000 feet. Up ahead I could see the black shell-bursts of anti-aircraft fire - but it wasn't in a big barrage like I had seen and flown through over Bremen, Kid or the Ruhr. It didn't look bad - then all hell broke loose! Flak started bursting right in the formation. Not up ahead, above or below - they had us "zeroed in." The concussions made our airplane buck; chunks of steel clanged into it; and with that the other airplanes of the formation went sail-in~ by. I was stunned at the havoc. 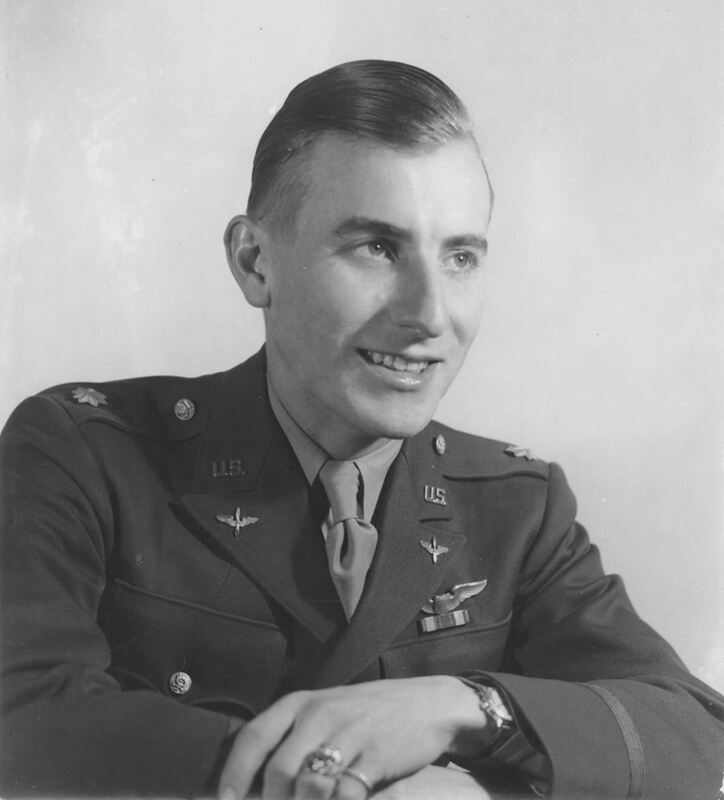 Captain Baumgart, with his eyes on the flight instruments flying the bomb run, quickly recognized that we had lost power on number four engine and promptly feathered it, along with applying full power to all others, but the formation had over-run us and was scattered - the bomb run in disarray. The bombardier did the best he could to adjust for the sudden change in air speed and loss of programmed altitude, but it was too late. Needless to say, we didn't get our bombs on the target. Five of our B-24s were shot down by that intense and accurate flak. My left wing-man had disappeared and my right wing-man, (ed. note: Lt. Dallas Books/Old Glory #724), - the deputy lead - was flying on three engines, too. Vernon Baumgart, now a retired colonel, remembers: "On post-mission inspection of El Lobo, the whole fuselage aft of the bomb bays looked like a hatchet-wielder had gone berserk. The flak cut the intercommunication and electric power cables to the rear turret, and the tail gunner couldn't communicate nor operate his turret or guns. When showing his plight to the waist gunner, he even held up the severed ends of his heated suit cord and pointed to the dangling airplane control cables. (Thanks, Convair, for installing dual elevator and rudder control cables.) One of his shoes had been sliced open by a ragged projectile - but barely cut the skin of his heel." Lucky gunner! Leaving the target area, our airplanes closed back into formation; eleven in the lead squadron and six in the second. Flying on three engines, we were ten miles an hour slower; thus the formations ahead pulled away from my little formation in a very short time. Worse yet, our Wing leader - the 44th Group - was forced out of position by another group cutting in at the IP. The 44th then had to do a large 360 degree turn for a second bombing run. This maneuver created a long gap in the bomber stream ahead of us and one behind us. The resulting isolation left us vulnerable and invited the ensuing fighter attacks. I remember that we had hardly taken stock of our situation when the waist gunner called: Fighters at 3 o'clock!" There they were, a whole "gaggle" of them; ten to twelve in close formation, paralleling our course about a half mile on our right -and climbing. I got on the radio and began calling for friendly fighters. Just like the "book" said, they climbed up to a one o'clock high position into the sun about two miles out, made a wing-over turn in unison and dived at us with guns blazing. It was a fearful sight but was over in a few seconds as they dived through our formation. Of course, all of our nose and top turrets responded with long bursts from their twin 50-caliber guns. It is hard to say how much damage we did to them as at the moment we were taking stock of their damage to us. One of their 20 millimeter shells exploded in the navigator's panel and steel fragments struck our navigator in the face and left eye. The waist gunners reported three airplanes falling out of formation. You can be assured I was on the radio emphatically calling for help. Vernon Baumgart says: "I can still see the navigator looking back at me through the astrodome and wiping blood from his face. Then Stupski (our pilotage navigator and nose gunner) yelled that the whole nose was full of blood. Next he yelled that the bombardier was trying to throw the navigator out. As it transpired, the "blood" turned out to be red hydraulic fluid from severed hydraulic lines. The navigator, being dazed from the exploded 20mm shell and his wounds, which cost him his eye, wanted to bail out. The bombardier was struggling to restrain him, and Stupski misinterpreted the action. The navigator soon quieted down and was given a shot of morphine to ease his pain." Time "whizzed" by and there they were again at three o'clock and climbing. Their sleek-nosed silhouettes identified them as Messerschmitt 109s or Folke-Wulf 190s. All we could do was to sit there and wait. Then - here they came again! Thirty-two years hasn't dimmed my view of those bright flashes of cannon fire aimed directly at me, my airplane, and my formation. No sooner had they dived below us when a waist gunner called excitedly that gasoline was blowing in on them and they were being drenched. The top turret gunner/flight engineer then reported he could see holes in the left wing and gasoline was spewing out, which in turn was sucked into the open waist gunner's window. I called the engineer to leave his turret and regulate the fuel valves so as to transfer as much fuel from the damaged cells as possible. This he did, and - there the Jerries were back at 3 o'clock and climbing. Believe me, it is sure scary to be at 20,000 feet in that "wild blue yonder" eyeing a persistent enemy you know is doing his best to shoot you down. With the gaggle perched at one o'clock high, I made my last call for friendly fighters and switched back to interphone and - here they came. If I thought "this is it," I can't remember, because just as swift as lightning, two P-38 Lightnings dived from "nowhere" right into the gaggle. The German fighters literally scattered like frightened sparrows - and we were saved. I had hardly heaved a sigh of relief when over the interphone came: "Pull up, pull up!" Captain Baumgart instantaneously snapped the airplane off automatic pilot and hauled back on the steering column. We pitched up and our B-24 sat "high, wide, and handsome" as the now meagre formation passed on below. Of course, the question was, "What happened?" I didn't wait for answers. It was one of the few times - as command pilot - I ever took over the airplane. We were sitting all alone at 130 miles per hour while the formation hurried on at 150 and I didn't want to be a "tail-end Charlie." "Pouring on the coal" with full power and putting the airplane in a shallow dive, I quickly gained air speed. I held the dive until I caught up with the formation, but some 2,000 feet below it. Using the full power and excessive speed, I gradually climbed back up to the formation and "tacked" on to the high element. Thank goodness! Baumgart's instantaneous reaction probably saved us from a mid-air collision, and as he says: "A mid-air collision can spoil your whole day." Back in formation, the answer to the question of "What happened?" revealed that an airplane to the rear and below us suddenly pulled up toward us, and it appeared that he would ram us - thus the call to pull up. Our crew witnessed fire in their cockpit and the airplane "went down" out of control. The Alps were still in sight, and we hadn't reached Strasbourg yet. How much fuel do we have remaining? I still had to make the decision of destination. Could we make it back to England or should we divert to and be interned in Switzerland? "Tacked" on to the rear of our remaining ten airplane formation, I still had to determine a destination - England or Switzerland. I called the flight engineer down from the top turret to read the fuel remaining in our tanks and made an estimate of our three engines' rate of fuel consumption and distance to England, and spun the E-6B computer. Remember it? You can rest assured I gave the risk factor of leaving the formation and striking out alone to Switzerland plenty of weight in my calculations. I concluded that we could reach the White Cliffs of Dover; then we would worry about a place to land - or bail out. Colonel Baumgart now tells me: "While the discussion of our fuel reserve was going on, the whole crew was breathlessly pulling for the decision to continue to England. This was our 25th and last mission and getting back to England was for our crew the same, at that moment, as getting back to the U.S. We were little interested in going to Switzerland." We were getting along really well. The three engines were roaring faith-fully; no instruments were in the "red"; our wounded navigator had been given a shot of morphine and wasn't bleeding badly; the gasoline-soaked gunners were okay, but extremely cold; and we were "hanging in there." It was nice to be among a few remaining friends and not a lone "tail-end Charlie"; however, our peace didn't last long. As we were passing Strasbourg, the waist gunner called out: "Fighters on our tail!" He identified them as twin engine JU-88s. We sat there waiting for them to press an attack, but they just sat back there out of the range of our guns. In a minute or so the gunner called: "They're firing!" Baumgart immediately pressed a rudder and skidded the airplane to the left for evasive action. Sure enough, off our right wing appeared a whole cluster of white puffs of smoke - exploding time-fused shells of some kind, probably 30 millimeters. The gunner called again and the airplane was skidded to the right. Immediately there appeared another cluster of white puffs off our left wing tip. This exercise continued for a few more minutes, ending finally when the Jerries apparently ran out of ammunition and we evaded being hit. Crossing France, some P-47s picked us up and escorted us across the remaining enemy territory. What a great relief it was to start our let-down over the English Channel, but the whole land mass was cloud covered. The concern of fuel remaining and a destination was again paramount. Another reading of the fuel gauges indicated that we could make it back to Wendling, and for fuel conservation we throttled back and let the formation proceed without us. Approaching our base at Wendling, I remember how nice it was when we called 2nd Air Division on emergency frequency for a vector to Wendling. The response was loud and clear, and shortly we could see the big yellow flares breaking through the undercast at the end of our runway. Our hydraulic system having been drained of fluid from the fighter attack, our landing gear had to be cranked down manually. Captain Baumgart made a smooth landing, and with only one application of brakes available, he eased the airplane on to the soft March sod to slow it down. Coming to rest without further incident, El Lobo and crew were a "sorry sight." The bomb bay doors even had to be pulled open from the outside, If the three of us on the flight deck would have had to bail out in a hurry, we would have been trapped in the bomb bay. How about that? Nine hours after take off, our safe landing was as welcomed an event as any event in my life. Fourteen airplanes failed to return to England. One or two made it to safety in Switzerland. Some of the 140 missing crewmen managed to bail out of their disabled or burning airplanes like the crew of the Jungle Princess. Some became prisoners of war or were interned in Switzerland. Most of them, I am sure, are numbered with the 6,032 airmen enshrined in the 2nd Air Division's Roll of Honor. The consoling after-thoughts of the 392nd's most disastrous mission are that several of the Second Air Divisions B-24 bombardment groups made devastating hits on the primary objective, and Friedrichshafen was never re-scheduled as a target!